Special meals will be available only if purchased in advance online with pre-registration. Children registered for “Children’s Activities” will have a simple lunch at their activity site. WOW luncheon starts here and convenes next door. Youth Event Meals: Do not include Friday. The youth activity fee includes Saturday breakfast, Saturday sack lunch, Saturday supper, Sunday breakfast snack. Youth can purchase a Friday meal if needed. On the menu: Buffet Style— Assorted Wraps, Fruit bowl, Bistro chips, Assorted cookies. Minister’s Educational Event participants are sponsoring the lunch. On the menu: Buffet Style— Salad-ranch & Italian dressing, Meat loaf, Gravy, Au Gratin potatoes, Seasonal vegetables, Dinner roll-butter, Carrot cake. On the menu: French bread sandwiches— ham, turkey, vegetarian, Fruit bowl, Veggie platter, Assorted cookies. Join us to hear about WOW 2018, and be in conversation about WOW 2019 and the PSWD Women’s Fellowship. 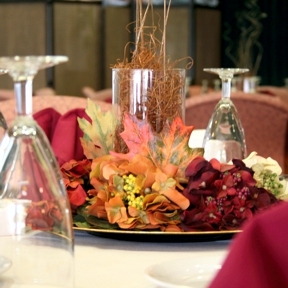 You’ll fill your plate in the Maury Smeltzer Lounge and carry it next door to the Private Dinning Room. Cost $16.95 Available until October 25 or the limit is met. On the menu: Plated Meal— Salad-baby mixed greens, poached apple, candied walnuts, Gorgonzola cheese, Raspberry Dressing, Chicken pasta nest-grilled chicken with pesto, provolone, roasted red peppers, Angel hair pasta w/red pepper coulis, Dinner rolls & butter, Cheesecake. Food is self-serve buffet style. The chef’s offerings will accommodate vegetarians and most special diets. A cook is also on hand for a limited assortment of “to order” items which are worth the extra wait (à-la-carte prices posted near the cashier). Menu & prices posted at the Cafe, order from cashier. Open Mon-Sat only from 11am – 2pm. Cost Varies: Available for purchase on-site only, not part of Conference program. This link (click here) will open up a “Google Maps” page with Hillcrest in the middle. Click on an “orange” dot or letter to get more information. The information table in the Village Center Lobby will have a list of local restaurants and fast food locations as well.